Our group’s research applies atomistic modeling approaches to study systems of relevance for advanced energy conversion technology. The majority of ongoing projects examine electrocatalytic systems, applying first principles modeling techniques to determine reaction mechanism and advance the design of electrode materials for fuel cells. Modeling studies are conducted in collaboration with experimentalists in electrode design as well as in a range of alternative energy conversion technologies including the development of polymer electrolytes for lithium ion batteries, fossil fuel reforming and desulfurization, and biomass conversion to liquid fuels. Please visit the individual project description pages for further information on our ongoing research projects. 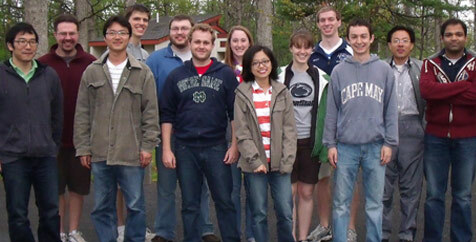 Photo of the Michael Janik Research Group from Spring 2012. From left: Eunmin Lee, Mike Janik, Kyungtae Lee, Michael Regula, Nate Gifford, Tom Senftle, Monica Esopi, Kuan-Yu Yeh, Nicole LaBarge, Brian Brady, Grant Elledge, Hongwei Gao, Siddharth Sitamraju. The Penn State Chemical Engineering Department website contains information on our graduate program application procedures. Motivated students interested in learning computational techniques while working in collaboration with experimentalists in advancing alternative energy technologies are encouraged to apply. Post-doctoral openings will be noted on this website, though accomplished candidates are encouraged to inquire at any time. Faculty member Michael Janik lends his expertise to co-editing the new book, "Computational Catalysis". Michael Janik talks with "The Daily Collegian" newspaper about the Chemical Engineering Graduate Program. Matthew Krcha Honored at the Chemical Engineering Research Symposium. Matthew Krcha receives the Outstanding Chemical Engineering Teaching Assistant Award. Department of Chemical Engineering in The College of Engineering at The Pennsylvania State University. Penn State's privacy and legal statements including: Equal opportunity, Non-discrimination, Privacy, Copyright.